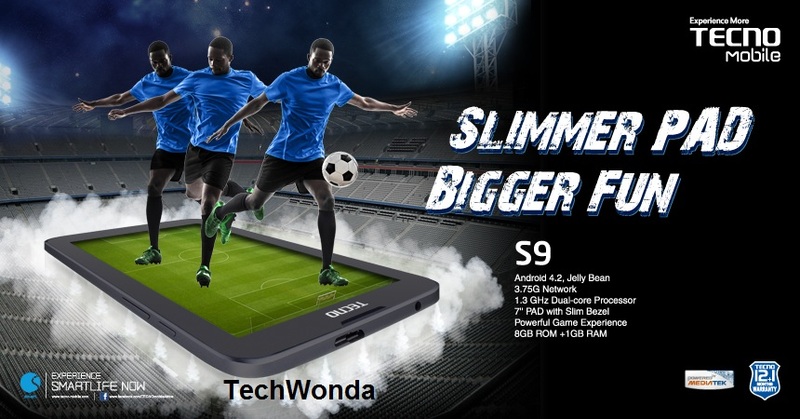 Yet again, Tecno mobile has unleashed a stunning tablet device called the S9. This device comes with a very slim bezel for better portability and handling. Its wide 7 inch screen is also ideal for gaming experience and watching movies. It also has dual SIM slots to allow for more than one network; 1GB RAM, 3G, Wi-Fi and other nice features. Although it feels good to see Tecno-Mobile jump off the 512MB bandwagon once in a while, but this tablet’s camera power is a no no. 2 mega pixels? come on Tecno. I agree with that, but this is 2014, 0.3MP is too weak to Skype with, or take selfies even. I remember the 2MP camera on my old Nokia which took pictures that looked horrible and pale on its small screen, now when you distribute those same pixels onto a 7-inch screen what do you get? I wouldn’t want to imagine. The low quality camera is worth it though when you consider how cheap this tablet is. 40K (or more) is the average price for a good tablet, so I believe Tecno-Mobile has done well to put this one at 20K thus making tablets affordable to a larger number of people. Screen Size: 7.0 inches, 600×1024 pixels resolution, 272 ppi (pixels per inch) density. Primary (Back): 2.0 Mega-pixels, Face aand smile detection, LED flash, 2592×1944 pixel picture quality. Secondary (Front): 0.3 Mega-pixels, 1600×1200 pixel picture quality. The Tecno S9 is sold for about $130, which when converted would be about Rs 7,500 Rupees in India and N20,000 Naira in Nigeria.